Rich Christian, Poor Christian: We're Not Worthy! For those of us that have been around a little while, you may recall the comedy sketch Wayne's World from Saturday Night Live, which eventually spun off into a couple of hit movies by the same name. 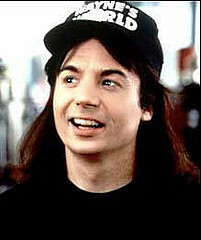 The sketch and movies featured the hilarious comic stylings of Mike Myers and Dana Carvey. You also may recall Wayne and Garth's little catch-phrase that they used upon meeting rockers Alice Cooper and Aerosmith, "we're not worthy." When they met these famous musicians, they would bow repeatedly and say their now famous line. I don't know if you've ever been in a situation like that, when you've met some famous people for whom you have a tremendous amount of respect for. It can be an extremely overwhelming and humbling experience, to say the least. A few weeks ago, I was extremely blessed to have the opportunity to participate in the worship service at Christ Church in Jerusalem. Christ Church is the oldest protestant church in the Middle East and aligned denominationally with the Anglican Church. As Anglicans, the church service is, of course, based on liturgical worship. Being raised Baptist, I am not extremely familiar with the various forms of liturgical worship, but I've been in enough liturgical services to understand the form and flow. I have an appreciation for this style of worship. The cool part of experiencing a different style of worship is that I think you pay attention to these differences in worship when you step out of the comfort zone of your personal "normal" worship service. "...all things belong to You. We thank You for giving us Your only Son even though we were not worthy of Your generosity. Pour your refreshing Spirit on us as we remember Him in the way He commanded through these gifts of Your creation..."
As I read these words with the congregation, I was given by the Holy Spirit several important reminders. First, we are not worthy of His generosity. God freely gave us His only Son in order for us to be in a relationship with Him. There is nothing we can do in order to earn His generosity. He loved us so much in spite of our total unworthiness that He provided an incredible gift of salvation for our souls. Second, we constantly need to remember the spiritual refreshment that the Holy Spirit provides to us through our salvation. And third, that regular reminder of His generosity comes to us as we respond to that generosity through giving gifts back to Him. Giving financial gifts during the time of offering should be an important response on our part in our worship of Almighty God. So, how about you? Do you often contemplate and consider the outpouring of God's generosity to you through His generous gift of salvation, even though we are totally unworthy of that gift? When you come to the time of offering in your church, what is your financial response? Do you give anything at all? Do you give begrudgingly or out of a sense of obligation? This week in your church, I would encourage you to take a different view of the time of offering. Remember what God the Father did for you in providing His Son, Jesus Christ, as the ultimate sacrifice for the penalty of your sin. Then ask yourself this question, "what should be my response to God's outpouring of generous love for me, when I'm not even worthy of that love?" I believe God's Kingdom would be radically transformed if His Church would simply respond to His amazing generosity to us.